Horses were in Annie Bronn's blood. For as long as she could remember, she had been fascinated by the spirited wild mustangs that roamed free throughout the West. So when greedy cattlemen started to round up the mustangs for slaughter, Annie knew it was up to her to save the breed. The true story of Wild Horse Annie's crusade to save the mustangs is inspiring. Readers will cheer her on, all the way to the White House, in her struggle to preserve these beautiful creatures from extinction. 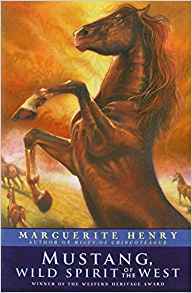 This book holds the story of a young woman who grows up to love the wild horses. To her dismay, cowboys are hunting the horses and killing them for sport. She firmly works on putting a stop to this horrible madness. A wonderful story, very inspiring. I will put this on my reading list. I got a whole stack of horse books for my birthday so I have to read them first - LOL!